October 12, 1492. This was the day when the explorer, Christopher Columbus discovered America, a new world of living. The voyage of Columbus has been celebrated since the colonial period, but it was in 1937 that this day was declared a federal holiday in America. Long before its declaration as a federal holiday, presidents, poets, teachers, preachers, and other important people have celebrated the landing of Columbus by different rituals to teach patriotism to the people. 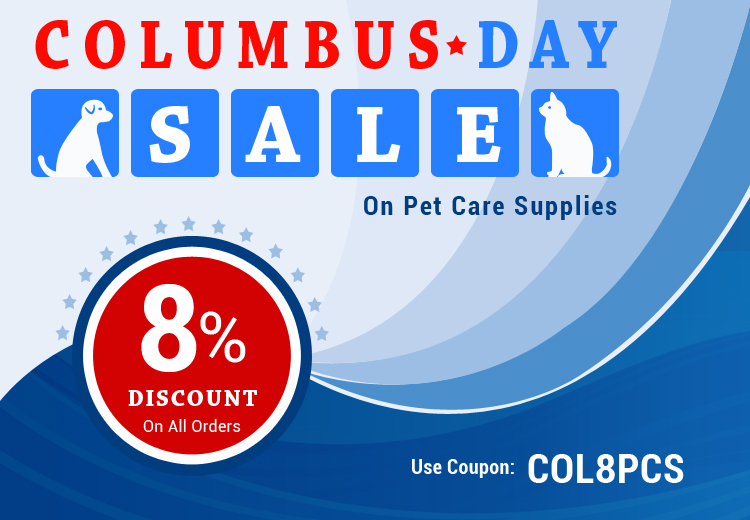 To celebrate this big day, Pet Care Supplies is going to slash prices by 8% on the best of the brands. The season of celebrations has started and with it we don’t want pet owners to spend their hard owned money on expensive pet care products when they can buy them at super affordable prices from PetCareSupplies. Starting from today, you can avail as many products as you want at the most competitive prices from our online store. What can you shop for at PetCareSupplies? The virtual shelves of PetCareSupplies are always stacked with the most promising supplies for canines and felines. You may find our products categorized into 4 categories: flea and tick treatments, wormers, wound repair, and joint care. This is the time to grab efficient products like Frontline Plus, Activyl, Advantage for your canines and felines at super affordable prices. PetCareSupplies has been in the market for quite a while and the main reason of its acceptance by the pet owners of the country is the discounted rates. Here, the prices are almost less by 40% than the prices at other online or physical stores. Why you must take advantage of Columbus Day Sale? PetCareSupplies has a huge range of products available for canines and felines. This can be the best time for the first timers to check out the collection. The best brands of pet supplies are sold at discounted rates on our store. Regardless of the big names of pharmaceuticals, you can avail their products at extra discounts. PCS do not charge for shipping, irrespective of the order’s size. You can buy a product worth $2 and get it at your door without any shipping expenses. Thus, you have a 3-way saving deal on this Columbus Day! Extra discounted prices + 8% off on any product you choose and free shipping. This is the best opportunity to stock on your pet supplies! Thus, visit our store to get the best of brands at discounted rates and an added cut off of 8% on this Columbus Day! Our sole aim of this sale is to reach maximum number of pet owners and to make pet care affordable! Use coupon code: COLDAY8 to avail the discount.